to have Masses and the Divine Office prayed for them by the Benedictine Monks at the Abbey. The monks at Christ in the Desert are consecrated Catholics whose whole lives are dedicated to the love of God and neighbor. Essentially they are apostles for Christ, filled with a passion for the good of souls and the glory of God. Their mission is prayer and this is an opportunity to have them include your loved ones in their work of God every day of their lives. The requested donation for this Perpetual Enrollment is one thousand dollars ($1,000.00) and is tax deductible. 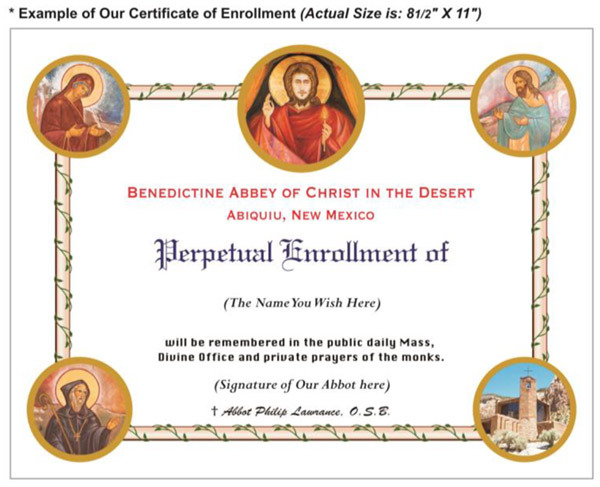 Those enrolling receive a beautiful Certificate of Enrollment from the Abbot of the Abbey. The Monks rise in the early hours before dawn to enter the Abbey Church to begin praying for all who have asked and for all in need. These prayers given by God in Holy Scripture are offered seven times each day. The monks offer a sung, High Mass each day as prescribed by our Holy Catholic Church. 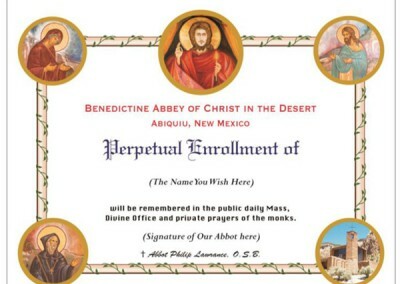 Perpetual Enrollment may be for anyone regardless of his or her faith. It is a truly wonderful, compassionate, and generous way to express an enduring prayerful remembrance for your families or loved ones. What is essential is that the Masses and prayers are being offered to God by monks who have joined in the salvific efforts of the Lord Jesus Christ, filled their minds and hearts by the presence of the Most Holy Spirit, and offer all they have and do for the Glory of God, the Father Almighty. Please use the form below (or print out and mail this form) to secure the Perpetual Enrollment for those you love. We would like permission to send you very occasional news and updates from the Monastery. 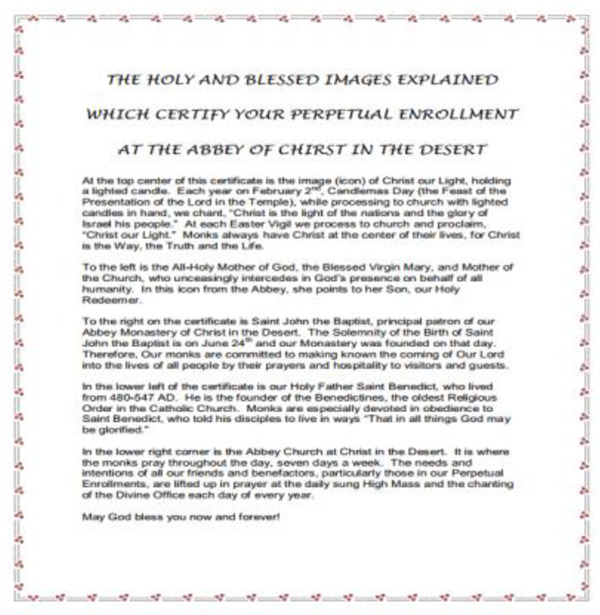 We can send the Certificate of Enrollment and Explanation of Images to you or to someone else. Those enrolling receive an 8 1⁄2” x 11” certificate. 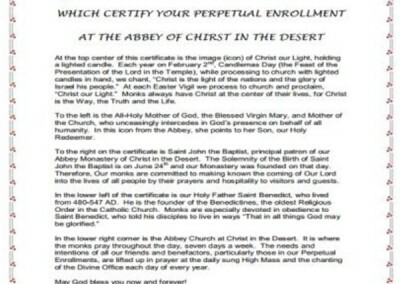 A written explanation is sent along with the Certificate of Enrollment.